First Eye Care, Inc. is an association of optometrists formed in 1985. Our goal is to have successful practices filled with happy patients. The original 18 doctors maintain independent optometry practices in Dallas, Fort Worth, Arlington, Grand Prairie, Carrollton, Plano, Irving, Bedford, Killeen, Southlake, Prosper, Weatherford, Roanoke, Corsicana & North Richland Hills. 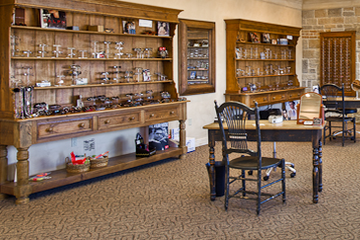 First Eye Care Corsicana came into being in 2005 but traces its roots back more than another 20 years. We believe in giving you the best service in town. We strive to make your experience in our office a pleasant one. Though we operate independently in Corsicana, First Eye Care is a shared name with a shared corporate philosophy – “Vision Made Clear”. Our goal is to consistently implement these values into our day-to-day operations and to continue to produce successful practices filled with happy patients. Established in 1972, our office specializes in caring for all your vision needs. We take our time with each patient that walks in the door to get to know the patient and understand how we can best help. We often begin treating an individual, they are pleased with our 'patient-centric approach', and that individual brings their family and ultimately, we end up treating multiple tiers of the same family. We take pride in building lasting relationships with our patients, which is why we take the time to get to know you, your vision requirements and your lifestyle needs. We are a locally owned and operated, family-run office!